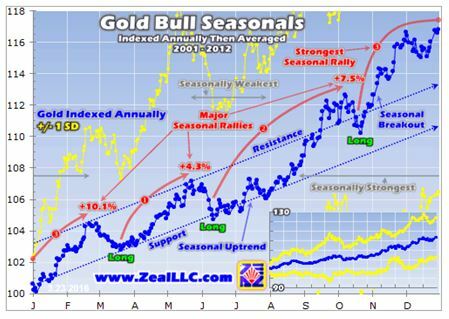 In a very interesting article posted at http://www.gold-eagle.com/article/gold-stocks%E2%80%99-spring-rally Adam Hamilton provides the following chart that shows gold’s seasonality during the bull run from 2001 through 2012. While many analysts are suggesting gold will be very weak during April and May and do not see any significant rise in the yellow metal until the Fall, Adam shows that during this prolonged bull market in gold the end of March, where we are now, has usually been a good time to increase your gold and gold share holdings. Of course, not included in the seasonal map has been the data during what Adam terms the “fake” gold bear market caused by massive stock market stimulus that caused investors to opt out of gold and other alternative investments. In fact, as he points out, the bear market in Q2 alone, plummeted by 22.8% which was the worst calendar quarter in an astounding 93years! But now not only does Michael Oliver’s structural momentum models tell us we are in a new gold bull market, but also, by definition, gold is back in a bull market. Bull markets are defined as a rise higher by 20% or more from the preceding extreme low on a closing basis. By that definition, gold has entered a bull market by early March when it exceeded its December 2015 low by more than 20%. So here is the point. While foxes like Goldman Sachs wish to lure you into selling your gold (perhaps so they can buy it? ), Adam is suggesting that now that we are in a new bull market for gold, the next two months may well conform once again to the patterns displayed in the chart above. 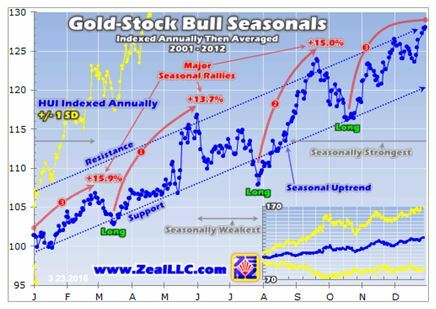 If the normal bull market’s seasonal patterns do reassert themselves now that should be tremendous news for our gold shares which have already had a great run. I say that based on the seasonal patterns for gold shares rise by more than gold bullion in percentage terms. The average rise in the months of April and May during the 2001-2012 bull market for the shares was 13.7% as measured by Adam, compared to a 4.3% for gold bullion. This article was published at Bloomberg on May 20, 2015. It was authored by Nicholas Larkin and Eddie van der Walt. “A move to a gold standard in China would require an exchange rate of as much as $64,000 an ounce, 50 times bullion’s price now, according to Bloomberg Intelligence. Gold for immediate delivery traded at $1,207.89 an ounce in London on Wednesday. In another scenario assuming an exchange rate at today’s price, China would need about 525,000 tons, Bloomberg Intelligence estimates. Only about 175,000 tons have ever been mined, according to the London-based World Gold Council. Bullion played a central role in the international monetary system until the collapse of the Bretton Woods framework of fixed exchange rates in 1973. While gold’s role has diminished since then, most central banks have some on their balance sheets. China last updated its gold reserves in 2009, when it owned 1,054.1 tons. Bloomberg Intelligence says the central bank may have tripled the holdings since then. China and India are the largest consumers of the metal. Yi Gang, the central bank’s deputy governor, said in March 2013 that the country could only invest as much as 2 percent of its foreign-exchange holdings in gold because the market was too small. Chinese policy makers are pressing to add the yuan to the IMF’s currency basket, known as the Special Drawing Right, which includes the dollar, euro, yen and British pound. The Bundesbank said in April that the yuan needs to be seen as freely convertible before it can be considered as part of the SDR basket.